Oh what a difference a year makes. Just when I and many others thought this show had hit the low point last year, this year was even more troubling. As I mentioned I have been covering the Detroit Auto show for more than 20 years and over the course I’ve seen highs and lows, but this year was alarming on many fronts. First attendance was WAY down from last year that prompted a journalist colleague to say, “it was more like a carpet show that an auto show”. Next and most troubling was the major holes left by the departure of Mercedes Benz, BMW, Audi, Porsche and the rest of the no-shows that was most glaring. To fill in the gaps the basement/concourse dwellers-typically tier one suppliers and industry trade associations- got the Jefferson treatment and were moving on up to the East Side (of the main floor) that is. Companies like GAC Motors, Mahindra, Denso, ZF Analog and a handful of others were now next door to the big boys. 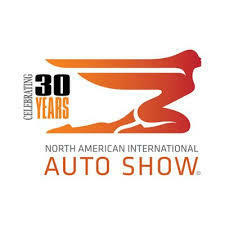 This along with the Envy Auto Group and the RK Rally exhibits made the show seem more like the regional auto show, think Chicago, than a major showcase for automotive announcements, innovations and product reveals. Having said that, I was intrigued by one in particular, the Roxor assembled by Indian auto giant Mahindra just up the road in Auburn Hills, MI. Technically, well legally, it’s not street legal, but if you or anyone you know is an off roader, a mudder, lives on or has access to large plot of land then this baby is for you. It has a “Willy-esque” appearance that promises unparallel performance that will tear up and down, on or over the trails, back roads and bogs this great nation can throw under it. It’s the Hummer of ORV’s and Kawasaki, Polaris and Razor got nothing on this bad boy. In fact I will be profiling this monster in the coming weeks so prepare to get down and dirty! Of the brands that remained several stood out and took advantage of the situation, the extra space and the extra attention that was available this year. I had a “ball” covering their presentation not only because president Scott Keogh doubled down on VW’s commitment to building passenger cars, much like their Japanese counterparts had done earlier, but also because they announced that VW will be US Soccer’s presenting sponsor. Representatives from US Soccer including former national team stars Alexi Lalus and Ally Lauder were on hand, erg on foot to show their support. In his address he touted VW’s 42% growth and the 354,000+ vehicles sold in what he described as a “flat” market, but referring to a 17,000,000+ market as flat…is flat…FLAT OUT wrong. Next up CEO Dr. Herbert Diess was reserved in his comments specifically his goals for 2019 and beyond. Where he wasn’t reserved was in his praise and glowing endorsement of Scott’s leadership. Is/was this the proverbial “kiss of death”? Only time and sales will tell; however their lineup is strong in all areas and with the announcement that VW will be adding a new facility in Tennessee that will be the spearhead of their electrification strategy. Volkswagen have made a significant commitment in the production of vehicles in the USA. In fact both of Tennessee’s governors were in attendance with the outgoing governor Bill Haslam giving a very gracious and self deprecating address. I got a real kick out of seeing their exhibit which had a total soccer theme complete with goals and an artificial pitch that welcomed VW’s newest star the 2020 Passat and by all indications it’s going to be a golden boot winner with soccer moms and those that want a traditional sedan. Once again their products are impressive and the layout of their stand only enhanced their vehicle’s beauty. Most prominently was the LC convertible concept that was certainly the headliner this year. Along with the brand’s volume leader the ES 350, Lexus has a full stable of SUV’s, sedans and coups on display including the IS 350, LS 500, LC 500, RC 300 and the jaw dropping RCF. 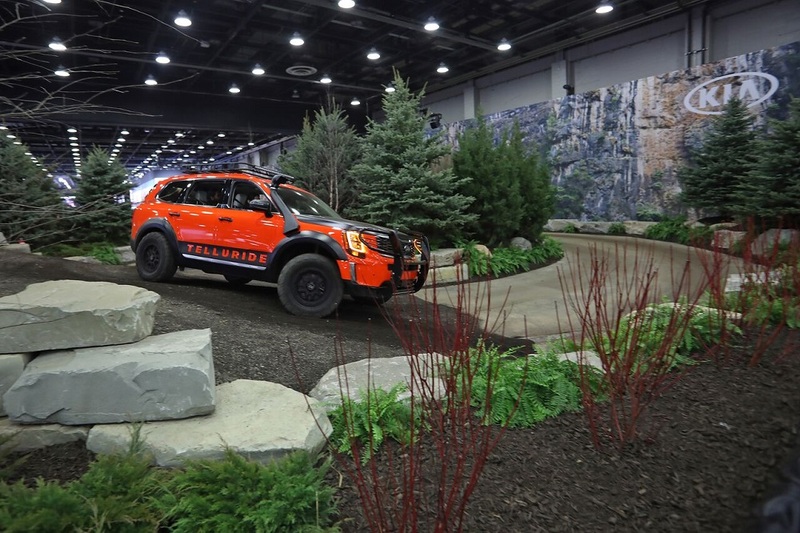 Kia really took advantage of the extra floor space on the main floor to stage an off road course on which to introduce and then demonstrate its new SUV the Telluride. Inspired by the city in the Rockies and produced in KIA’s West Point Georgia facility, this latest SUV began its life as a concept in 2016 that made its debut here in the D. This course nestled among conifers and an impressive background is in addition to its traditional stand that showcased its every expanding line up. It served as the perfect real world test of its capabilities and seeing it driving up hills and over obstacles was more impactful than any hero video could. In fact three models took to the course including the standard production model. After the presentation a lunch was served that was inspired by the two states that play a significant role in the new Telluride...Georgia and Colorado and no it wasn’t grits and a hash brownie! Toyota had another solid effort highlighted by chairman and CEO Akio Toyoda’s address to the assembled scribes in attendance. It was a genuine and humorous speech that truly illustrated his enthusiasm for the design, manufacturing but more importantly the testing of his products. The main focus of his comments and the stand itself was the return of the Supra. The reintroduced version of this “classic” has been completely re-designed and thoroughly re-engineered. Toyota officials already are and Supra enthusiasts in particular will be pleased with the final product and my guess is it won’t take long for those that don’t to join the growing chorus of those that like the look, but with a starting MSRP of $49,000 it will be treading in uncharted water and competing with noted brands. The remainder of Toyota’s line up remains solid with the aforementioned Supra joining Camry and the rest of its Pickup and SUV models. It’s loaded with strong contenders and segment leaders up and down their lineup. Mix in a dash of NASCAR and Toyota is starting to look and feel more like an American brand from Japan and not a Japanese company selling cars in America. As Toyota Exec Bob Carter said, “You can’t call yourself a global automotive brand if you don’t sell cars”. No truer words have been uttered. No surprises here. Their large display was again heavy on Dodge, Ram and Jeep, but can you blame them. The other red headed step children from the first marriage-Chrysler and Fiat-just have not resonated with consumers. This year’s big announcement was the RAM Heavy Duty Pickup truck. This behemoth is for those that need or I guess want and more importantly can afford to be a big muther trucker while seated in the lap of luxury. It completes the brand’s product ladder and its incredible rise. I predict it won’t be long before its knocking on the blue oval’s door. Jeep’s lineup is nothing to sneeze at either. The newly introduced Gladiator with or without its Rubicon appearance package is sure to be a hit with everyone. It joins the Wrangler and the Cherokee to form one of the strongest line ups in the industry and it’s no wonder FCA is so bullish on Jeep. As for the “Two Letter” and it’s still head scratching roaster of brands, corporate goals and leadership it’s no wonder the GMC, Buick and Chevrolet displays were vanilla. Chevy had baseball in the form of a VR simulator, but sadly no hot dogs, apple pie or exciting products. Think of khakis without Harbaugh. GMC has trucks and Buick, outside of the Enclave, is selling passenger cars that the company said it was discontinuing. Not a ringing endorsement. The same can’t be said for Cadillac with its reveal of XT6, the final rung in its product ladder, the preeminent American luxury brand is poised for a big year if it can penetrate the LA, Silicon Valley and East coast markets. That’s easier said than done given its track record, but I hope they can. The Blue Oval scaled back its normally humongous display but it still managed to highlight their current products in an impactful manner. The 2020 Shelby GT 500 was displayed prominently. This street legal track ready carbon fiber version will sure to be the company’s Halo vehicle, an homage to Ford’s heritage, as it transitions away for passenger cars to focus exclusively on trucks, SUV’s and trucks. Did I mention trucks? And why not they sell an “S with a hit” of them and they make a ton of dough in the process. “If it aint broke then don’t fix it” could be their new slogan; However when you add the Explorer to the mix, you can see why they are making the shift, even if you can’t. Like Detroit, the city it was born in, it appears that Lincoln has finally found its footing and is making a real come back. Capitalizing on its heritage and concentrating on its core principles by building an improved version of American luxury instead of trying to copy the European versions. This has allowed them to introduce a new generation of buyers, who never sat in a Continental or a Mark V, the opportunity to experience true American luxury it for the first time. It appears to be working as more and more seem to appreciate this brand. Even more significantly they are purchasing them. Coming off another banner year , Subaru came to Detroit to play and all though their stand only featured four cars (during the press preview) in one of the smaller displays, it spoke volumes about where this brand is going and why they are developing a loyal fan base. Starting with and highlighted by the 2019 WRX VT 19 X Rally Cross Super car, the WRX STI coup, and the WRX Imprezza STI Sport sedan the brand’s identity was on full display and it’s no wonder why their achieving increased sales. Well those are my thoughts not yours and if this was the last NAIAS of any consequence then it went out on a whimper. The next NAIAS is slated to be in June of 2020 and it will be interesting to see if the organizers and manufacturers can make this work. The possibilities are intriguing, but the realities of the business are not going away, either is CES, Geneva or the LA Show.